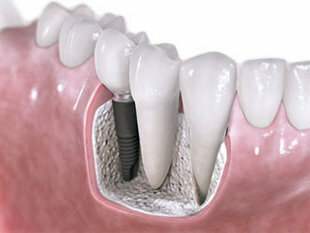 If your jaw bones are not strong enough to support a dental implant, your dentist will first implant a piece of bone. Your jaw bones can be damaged for several reasons. If you have a missing teeth or some diseases, a development deformity, had previous dental treatment or trauma your jaw bone might be in a poor condition. A successful bone grafting can also help natural bone growth. Before the operation your dentist will discuss your preferences with you. You can have a choice: you prefer a human donor, a bone of animal origin or a synthetic material. Using patient's own bone is considered the best solution, since it is a living bone extracted from patient's body Bone grafting is a safe and permanent solution to treat broken or damaged jaw. If you want to learn about bone grafting, there is an in depth article on Wikipedia.